Over the course of my adult drinking career, I have become the guy who loves the ‘dive bar.’ In every city that I’ve lived in or traveled to I’ve been able to pick them out with relative ease. Whether it’s the smell of stale beer or the tattooed bartenders, I’ve always had a kinship with these places. 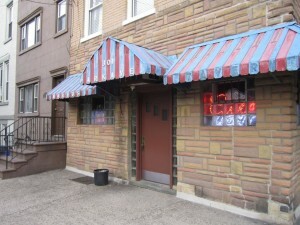 But then I moved to Hoboken and found out what a real dive bar is. And like a political candidate returning to a moderate position, my opinion for all things ‘divey’ has dramatically changed. Enter Mario’s Bar one of the last remaining old school Hoboken hold outs from days gone by. Mario’s Bar is located a mere block away from the hustle of Washington Street yet it embodies none of the characteristics of the watering holes that reside there. While it’s great to see a historic joint that refuses to embrace change, that did not translate during my visit. The front door seems to be the entrance to a private club on a residential street. And after I walked in, I quickly understood why- Mario’s is first and foremost a place for older men to drink. The age range in this place is 50 years old to I guess, death. Once inside, they set among their ilk slurping down bottled domestic beers (since there are no taps) and chat with the bartender (also an older man) about sports, the news, and anything else they have a problem with. The problem is that despite all of the gruff inside, this place has a ton of character and could easily be a fun and historic local bar. All of the original wood, tin ceiling, and kick-knacks are intact and don the walls. (They literally wouldn’t let me take any pictures. Sorry) Yet you wont find a welcoming place for outsiders who want to have fun. It was like a scene out of ‘Animal House,’ because as soon as I walked into this place the record stopped. This place is not huge fans of outsiders, but the bartender was friendly enough to serve me. The price of beer during the week is really the best thing going for Mario’s right now. At $4 dollars a bottle for a Bud, I wouldn’t mind coming back in here again if I had a book to read or just wanted to look at the walls or the ceiling and take in some history. It’s somewhat of a downer because this place could be excellent and could bring in some positive business for the ownership if they changed their attitude. But hey, sometimes people are set in their way, especially when it comes to their only escape from the wife. Preconceived notion – A old man bar that isn’t fond of outsiders. Bar Type – A old man bar that isn’t found of outsiders, but has cheap beer and a solid jukebox. Crowd stereotype – Old men, who love the sauce. And G-d bless them for it. Music – Oldies to classic rock. Value – $4 dollar bottles of Bud. Date – Sure, if it’s your 50th anniversary and you met at this place when Ike was in office. If not, don’t even think about it. Hookup – No, and I’m shocked you would even look in this category. Dance – If everyone’s really drunk and its St. Patrick’s Day, still no. Catch up with a friend – Since Mario’s Bar is relatively quiet, I’d say yes. First or last drink of the night – First, I doubt you want to see what goes on in here after dark.